Windows: GUI: "Missing Paths Recovery" functionality crashed the program, caused by Unicode paths related changes. OS X: GUI: Preview positioning is not correct on first use. Note that version 2.6.0 does not introduce new functionality. GUI: loading/saving zip compressed images failed, see http://tech.groups.yahoo.com/group/fdrtools/message/72. GUI: progress text was not correctly cleared after ending a task. GUI: Unicode paths did not work on Windows. GUI: create default projects/templates folder only if necessary. GUI: add "All" to list of file formats of input file chooser again. Preferences: passing output profile (-o) to dcraw did not work. OS X: some color profiles were not detected correctly and caused the program to crash. HDR Creation: Creative: when dragging one of the global weighting curves the resulting HDR image could become (and stay) black. HDR Creation: Creative: when deselecting all layers the resulting HDR image is (and stays) black. HDR Creation: switch off exposure value adjustment via dragging the mouse. This update is free of charge for registered users. Tone Mapping: quick adjustments to tone mapping sliders resulted in false parameter values. Version 2.5.0 adds important usability features like "Undo/Redo" and fixes several stability issues. Make the source images directory the default for the output file chooser. Tone Mapping: Compressor: redesign of "History" functionality. Using "Tabs" for branches it is now easier (and faster) to switch among branches. Tone Mapping: Compressor: "History" resp. "Undo/Redo" functionality added. Tone Mapping: Compressor: "Save/Load module state" feature added, also known as "Save/Load settings". GUI: improve responsiveness of scrolling in Preview mode. GUI: the Preview can now be zoomed via the mousewheel. GUI: make selection in the "small" Navigator within Preview moveable by dragging via left mouse button. GUI: hide (evtl. visible) Preview when closing a project. Projects: derive project name and output file name from input images. Preferences: option to configure the program language added. Preferences: add "output color space" parameter to "Raw Conversion" tab. System: add entry to the Windows registry so that FDRTools executable can be found from other applications. External software: "dcraw" updated to v9.10 and "ExifTool" updated to v8.65. Calling FDRTools with images as arguments resulted in a small black stripe at the bottom of the Navigator. OS X: calling FDRTools from the outside (Finder, Photo managing apps etc.) with images as arguments sometimes failed. OS X: HDR Creation: Separation: possible crash, e.g. when using many source images (reported by Richard Sisk). HDR Creation: Creative: ease a memory allocation peak possibly slowing down machines with little RAM. GUI: several redrawing issues with Progress indicator and Navigator/Preview window. HDR Creation: Creative: produced visible tiles in the saved image. GUI: Navigator: pressing the Panorama buttons repeatedly could crash the application. While loading images more memory than necessary was allocated. Fixed the bug reported in http://tech.groups.yahoo.com/group/fdrtools/message/55. Tone Mapping: Compressor: Contrast: Luminance failed to work for certain image types. Fixed the bug reported in http://tech.groups.yahoo.com/group/fdrtools/message/53. GUI: application may crash while resizing/scrolling the image preview. Windows: program could not be started after installation. Preferences were not saved when quitting the program. HDR Creation: Separation: strange colors may occur in regions with moving objects (multithreading related). HDR Creation: Separation: color shifts can occur when switching from Exif to Auto and back to Exif. HDR Creation: Separation: choosing all color channels as separators causes grain in regions with strong colors. HDR Creation: Separation: pressing the 'Defaults' button does not switch off separation mask and does not deselect layers. HDR Creation: Separation: with active Separation module the program could crash during image saving. HDR Creation: Separation: active separation mask caused crash when switching between tonemapping modules. Projects: thumbnails from .dng's were not recognized. Projects: project settings are lost if the "Save" dialog is active while the project settings are being saved. Tone Mapping: Compressor: Postprocessing curve: changing dynamic range and collapsing the curve caused problems. Tone Mapping: Compressor: the label text of slider "Smoothing" is not always redrawn if the tooltip of the "Compressor" slider is being displayed. GUI: improve behaviour of the main window Close button. With version 2.5.0 support for the Mac Power PC platform is abandoned. This release fixes a bug in the Windows OS installer. Detection of installed Photoshop versions does not recognize the latest Photoshop version CS5. Version 2.4.0 brings new features and many improvements to the "innards". It is now possible to process large images. Introduction of multithreading utilizes the power of multicore processors. Moreover new options allow for more control over the tone mapping process. Tone Mapping: added slider "Color Contrast" to the Compressor module. Color Contrast allows to adapt the contrast of colored regions. OS X: Navigator/Preview: scrolling the image in Preview mode can crash the program. Navigator/Preview: dragging the image in Preview mode is sluggish. Navigator/Preview: correct Preview scale slider range so that zoom value increases from left to right. Projects: exiting FDRTools after modifying the project name without leaving the name text field looses the modifications. Tone Mapping: curve control has a problem drawing first and last knot under certain conditions. Tone Mapping: correct Receptor Compression range. Gui: opening the Save Image dialog via the "Images->Save as..." menu entry crashes the program. Make "Simplex" the default tonemapper (because of computational requirements of "Compressor"). Save file dialog: delete file name when closing the project. Tone Mapping: modified the value range of Black and White Point sliders in order to avoid possible display problems. OS X: Tone Mapping: locking problem caused crashes when handling curve points. Application could crash when pressing the main window "Close" button while processing is going on. Disable curve control function to change axis ranges via first/last curve point. While this functionality is handy it puts restrictions to the first/last curve points. Integrate HDR and LDR save dialogs. Create replacement for former HDR Inspector view. Consider HDR as a special case of tone mapping, i.e. identity mapping. Augment curve control capabilities by allowing to change y-axis range interactively. Add new controls to tone mapping dialogs (Exposure, Dynamic Range, Black Point, White Point). Add possibility to modify "image resolution" metadata fields prior to saving the resulting image. Color space of HDR image is now configurable. Preview zoom range extended to 400%. Module xDOF temporarily removed. xDOF makes real sense only with comprehensive image alignment which is not there yet. I'm sorry. Zoomed view could crash when dragging the scrollbars (related to multi threading changes). Make controls in alignment and HDR creation modules responsive. Remove blockade between push and drag events in curve widgets. Pink highlight problem of some Canon 50D cameras fixed. Problem reading project files of future FDRTools versions fixed. Program crashed when pressing the Close button of the main window during a computation. Various issues of the White Balance tool solved. The issues are mostly related to multithreading support introduced with v2.4.0. Integration of former 'Navigator' and 'Preview' windows. Integration of former 'Progress' window with the Main window. Make controls "responsive". E.g. when dragging a slider the screen is updated without the need to release the slider. Performance: reduced memory usage, especially when working with many source images. Performance: optimisations in tone mapping modules. Reading 16 bit TIFF images could crash the program. Fixed potential crash situations caused by introducing multithreading. Performance: several optimizations in order to speed up algorithmic calculations and image loading. Preferences: added feature to detect system display profile. If enabled the detected profile is used instead of the manually configured profile. "Out of memory" message close button showed no reaction hence application couldn't terminate. Quick repeated use of the white balance tool pipette freezes the program. Receptor tone mapper had a bug introduced in the course of the modifications for v2.4.0. Projects: added missing parameters and repaired unsaved check. Switching among HDR generators could cause a crash in certain situations. Once in a while crash on cancelling project changes. Coordinates and RGB value within Preview were not displayed correctly. Resulting images of integer formats were always scaled to the maximum integer value thereby foiling deliberate downscaling by the user. Images were not correctly "prepared". When reading prepared images histograms were missing alongside other side effects. Histograms were not always drawn correctly - missing histograms or flickering. Redraw behaviour of Preview had a few shortcomings. Drawing of tabs has been slightly modified. "Color Plus" button was activated when pressing "Defaults" with only one image loaded. Ability to process large images. Support for multicore processors / multiprocessor systems. New controls broaden the tone mapping options and allow for more precise adjustments. This release fixes a critical bug in version 2.3.2. Reading project files of future FDRTools versions (e.g. the 2.4.0 Beta versions) crashes the program. Important: support for FDRTools is undergoing a change at the end of this year. For several years this Forum was the main source of support for FDRTools - in addition to personal email. I chose this form mainly because the forum software provided an easy way to archive discussions and to find them again at a later time and hence find answers to your question fast, provided the topic was discussed some time in the past. First and foremost there is spam. It is hard work to keep a forum free from spam messages and almost impossible to keep spammers from registering to the forum. Secondly the web only interface to the forum software is not convenient. Writing messages works but it is a lot less comfortable compared to writing messages with an email client. What's more: you have to visit the website or use feeds to get the latest messages. That is not convenient when compared to the simple pushing mechanism of mailing lists. Finally personal email was not communicated to other users even if the topic was of common interest. Some users simply refused to use the forum software. On 31/12/2010 the FDRTools forum will be switched to read only access. This means: registering to the forum will be disabled. Moreover posting messages will not be allowed any more, neither new ones nor replies. However, the forum will be further available as a read only resource for a transitional period. This means you can still search the forum and read earlier postings. The forum will ultimately be closed on 30/06/2011. You can join the group now and start posting messages. Current forum users: there will be NO automated migration of existing accounts to the Yahoo Group. 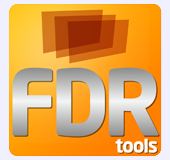 If you have further interest in FDRTools please join the Yahoo Group. Thank you. Concerning current forum message base: there will be NO automated migration of forum messages to the FDRTools Yahoo Group. If questions arise that have been discussed in the forums earlier we will discuss them again in the FDRTools Yahoo Group. There is no problem with that. PS: please do not try to get support via personal email any more. Instead post your concern to the FDRTools Yahoo Group. Thank you. This release fixes an OS X specific critical bug. Note: the Windows version is not affected and stays at 3.0.1. OS X: it looks like with OS X system upgrade to 10.6.3 one of the API functions related to color management has ceased to work. This function was used by FDRCompressor which in turn could cause Photoshop to hang/crash when calling the plug-in.